For enhanced durability and excellent wear protection, the 22B Trailer features a standard spray-in bedliner that covers the complete trailer floor and loading ramp. No tools are required to lower the ramp into the loading position or raise it into the transport position. Simply pull the handle of the spring-loaded, stainless-steel pin on the left-hand side of the trailer to pull the pin out of the notch and lower the ramp into the loading position. Or pull the handle and raise the ramp into one of two transport notches to secure the ramp into the transport position. The proper transport notch to use depends on the quantity and type of greens mowers loaded into the trailer. The stainless-steel design leads to increased durability and long life for the pin system. The grooved disc roller can be used with 55.9-cm (22-in.) Quick-Adjust 5 (QA5) cutting units, in combination with the GTC and FTC, to provide additional roller options for fairway, tees, and approach areas. The increased diameter improves the durability over smaller rollers and it features hardened discs for improved wear which retains spring tension for reduced maintenance, making it an ideal roller for fairway, tee, and approach mowing. Welded steel tubes at the front corners of the 22B Trailer provide easy and convenient storage for the retaining rod system when the walk greens mowers are unloaded from the trailer. No tools are need to remove the retaining rods. Simply lift the latch and remove the retaining rods to allow unloading the greens mowers. Place the retaining rods into the welded tubes at the front of the trailer for storage. 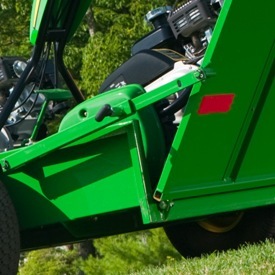 When finished mowing, load the greens mowers onto the trailer, remove the retaining rods from the storage tubes, and re-install across the front of the greens mowers to secure during transport. The 22B Trailer comes standard with two axle bracket kits, which allow loading and unloading any combination of John Deere 18-in. (45.72 cm), 22-in., (55.88 cm) or 26-in. 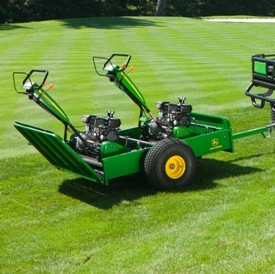 (66.04 cm) Walk Greens Mowers. 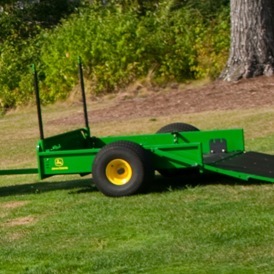 The trailer is compatible with all A, B, C, and SL Series Walk Greens Mowers, as well as the 220 E-Cut™ Hybrid. The axle brackets are adjustable side to side and fore-aft to accommodate walk greens mowers of different widths and lengths. For easy loading and unloading of two machines in the same trailer, install the brackets so the narrowest mower is stored in the front position on the trailer and the widest mower is stored in the rear position. 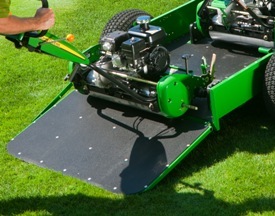 To keep the walk greens mowers secure during transport, the 22B Trailer utilizes an adjustable retaining rod system that holds the front roller on the trailer floor. This minimizes movement of the unit in transport, ensuring the height of cut does not change while transporting from one area to another. 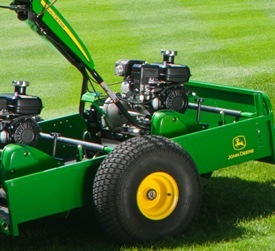 The system is height and fore-aft adjustable to accommodate different mower setups, such as front roller options, height-of-cut settings, and the walk greens mower type.